1 In a 3-litre saucepan, fry the onion in the oil for 3 minutes on a medium heat. 2 Boil the kettle. Measure out 900ml of boiling water in a measuring jug, then crumble in the Knorr Chicken Stock Cube and stir to make a stock. 3 Stir the rice into the pan, pour in the hot stock, then simmer for 8 minutes. 4 Stir in the diced chicken and continue to simmer for 10 minutes, stirring in the peas for the last 2 minutes. 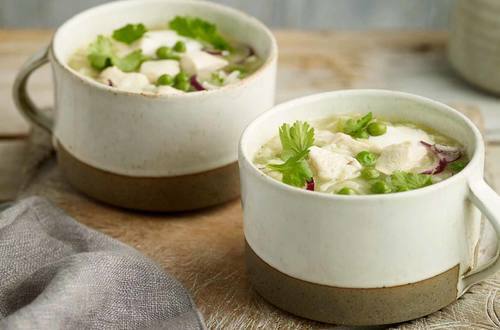 5 Ladle the soup into 4 bowls and top with a spoonful of crème fraîche, a few slices of sliced red onion and a scattering of chopped coriander. Serve with bread on the side.